Since installing my new student licenced copy of Windows 7 Professional in VirtualBox over the weekend, I've been testing how well my Windows-only software runs in it compared to my trusty ol' Windows 2000 VM. So far as good as can be expected, but there are few very strange anomalies. Case in point, my copy of Visio 2000 no longer works, but to my surprise the Microsoft Office website offers trial downloads of both the Professional and Standard versions of Visio 2007 I went ahead and clicked the download link for the trial of Visio Standard 2007, and was given another Digital River executable stub file. This time I was in Windows not on my Mac though, so it was less irritating. 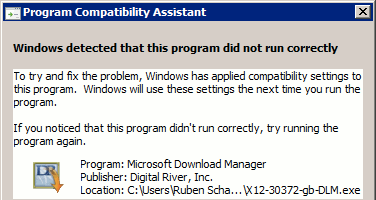 After downloading the real file I was given the above error message from the verbosely titled Program Compatibility Assistant telling me the application didn't run correctly. I had suffered a crash and all my gadgets disappeared an hour previously, but this application didn't terminate strangely or unexpectedly, and the Visio installer worked without a hitch. Very strange. I did find it amusing that I downloaded the latest trial version of an application, and ran it on the latest flagship version of a vendor's operating system, and an application titled the Program Compatibility Assistant told me the application didn't run correctly. I remember back in the old days whenever I downloaded something from Microsoft it would go through Conxion, was that the name of it? When did they replace them with Digital River?